*Three holes independent installation, double cross handles. 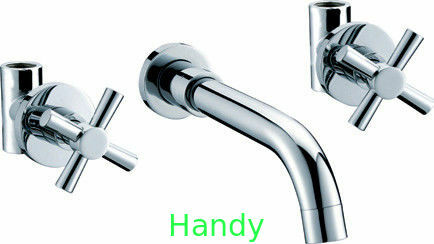 Hotel faucet, home faucet, household faucet, bathroom faucet etc. 8~12um, including 3 layers, copper, Nickel and Chrome. Laser LOGO on faucet’s handle, paste products label on our neutral color box, with our brand printing or OEM brand printing, increasing the advertising effectiveness and marketing promotion.